The pigment of oil paint can look different depending upon how it is applied. Various oil painting techniques will give the painting a different look and feel. Paint applied thickly will look different to paint applied thinly. The color label on a tube of paint is only part of the story, as can be seen here. When applied as a translucent glaze on white gesso, French ultramarine will possess great luminescence, because of the white gesso shining through the paint layer. The blue will almost appear to glow, like sapphire. If a little titanium white is added to the blue, the ultramarine will not only appear lighter, but this translucency will vanish. This is because adding white adds opacity and therefore reduces luminescence. 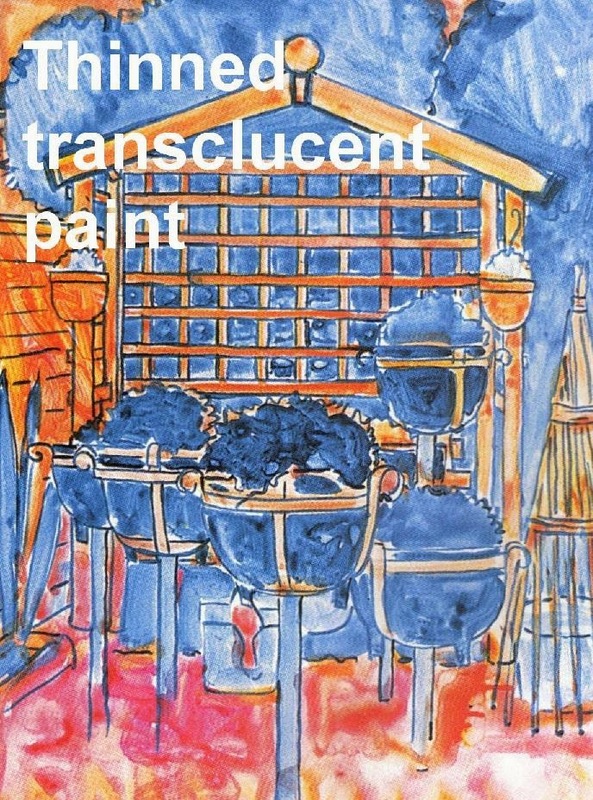 The close up image shows this treatment of ultramarine and alizarin crimson. The upper row shows a thin coat of pigment. The lower row shows the pigment with white added. Notice the nature of the color changes as well as its tone. There are other ways of applying a color. In this image, the upper pigment has been applied thickly. Notice little imperfections and unevenness in the layer. 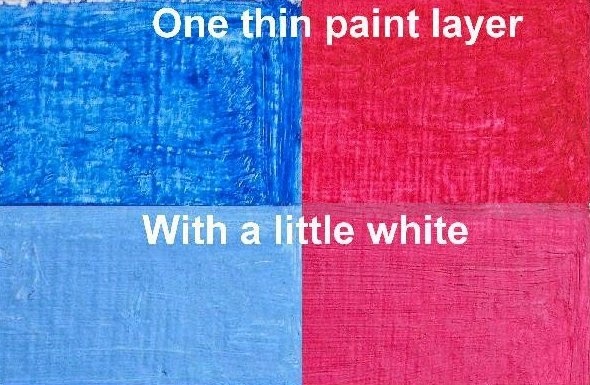 A single paint layer is difficult to perfect because of the white showing through in places beneath. The solution to this is to allow this paint to dry and then apply another coat on top. This can be seen in the bottom paint layer. Here, two thin glazes have been applied one on top of the other. Notice the evenness of the paint layer and how one evens out the other. See my Youtube clip that demonstrates how I applied the paint in these four different ways. Applying the pigment of any oil color will appear different depending on the technique. A thin glaze applied straight onto white gesso will given it a transparent and luminescent feel. An example of this can be seen in the image of a garden arbor, that looks rather like watercolor washes. The oil paint can be thinned down further with a little linseed oil or artist spirits. 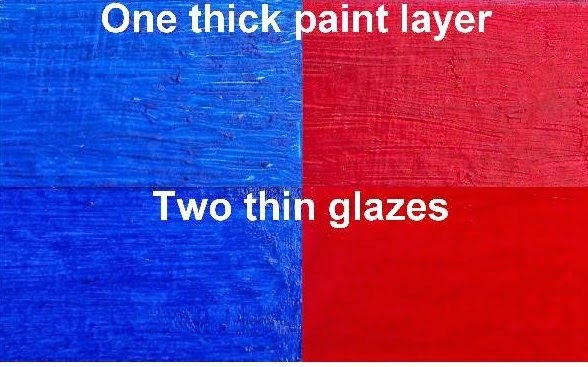 The opposite of a thin paint glaze is an opaque paint layer. None of the underlying gesso will show through. The paint is dense because a little white might be added to it, or it will be applied thickly. Opaque paint is necessary for flat, bright colors. 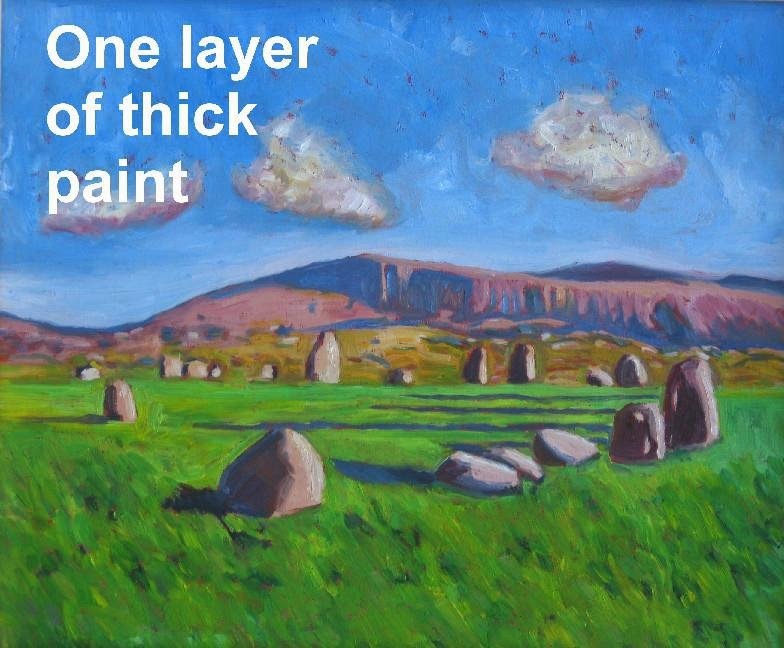 This image of Castlerigg Stone Circle in Cumbria shows the application of broken paint layer. The paint is opaque and fairly thick but applied in a rough single layer. This is known as alla prima. Alla prima is difficult to smooth out. The only way round this is to allow the first paint layer to dry before applying another layer on top. This will even out imperfections in the paint layer. 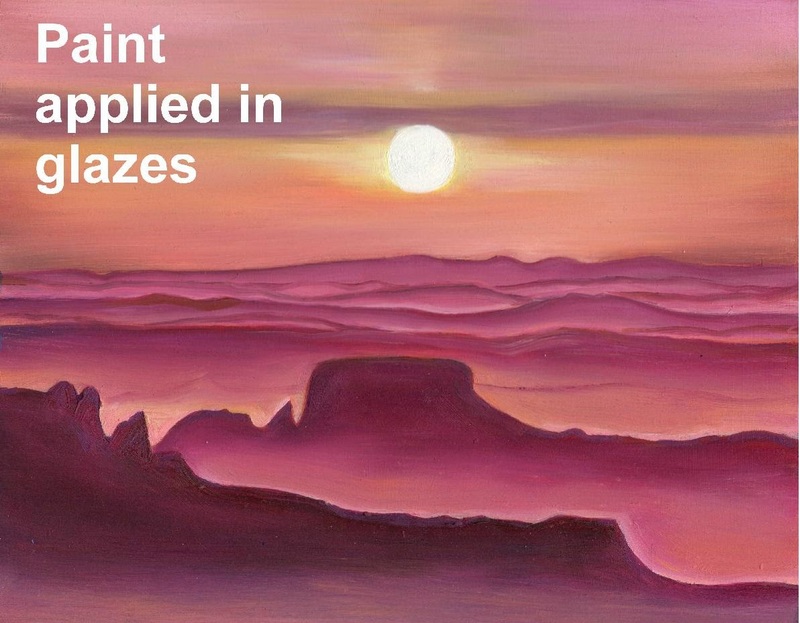 This image of radiation fog over mountains exhibits smooth glazes, as the painting was completed in two sessions. The first paint layer was applied fairly thinly, allowed to dry and then a second glaze applied on top. Often a little linseed oil is needed for the upper paint layer to add flexibility. As can be seen here, a given color can appear different depending on how it is applied. A translucent layer will appear different to a thick layer. Add a little white to increase opacity and the luminescence from the underlying white gesso will disappear. Applying one paint layer over another will create a smooth, almost perfect paint layer. These four states of color can be used to create a desired effect in oil painting.